The distinct red horn on this caterpillar’s posterior identifies it as a Tobacco Hornedworm. This specimen is in its final larval stage and preparing to pupate in the soil. Initial impressions can sometimes be deceiving. At any point in time the subject of examination may be in a temporary transitory state which soon passes into a condition more representative of the creature’s primary existence. Most local insects are excellent example of this principle. They may appear bright and colorful, only to change into a muted color scheme. Some can appear slow and sloth-like, but change into an agile species zipping about at near lightning speed. Important to landscape managers, homeowners and gardeners, the bug may be a gluttonous consumer of prized foliage only to become a nibbler of insignificant compounds. One native resident of Wakulla County fits all the attributes described above, the Manduca sexta. More commonly known as the Tobacco Hornedworm in its larval state, it is one of the dreaded leaf defoliators which will eat the developing vegetables too. In its mature state it is transformed into a nimble moth which whizzes from flower to flower in search of nectar. The adult stage is sometimes called a Hummingbird Moth or a Hawk Moth for the pace of its wing beats and rapid flight. 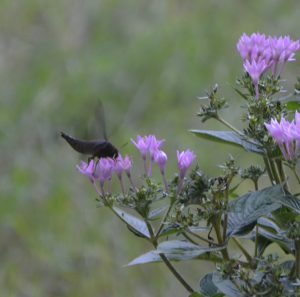 It is easy for a casual observer to mistake it for a hummingbird when seen around flowers. 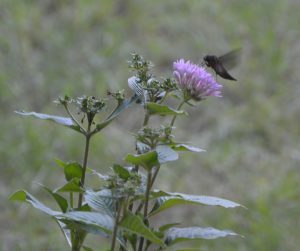 Often seen around flowers, the Hummingbird Moth’s flight patterns and behavior mimics hummingbirds. This species is closely related to and often confused with a similar appearing caterpillar in the same genus, the Tomato Hornedworm (Manduca quinquemaculata). The larval state of both feed on the foliage of various plants in the Solanaceae family such as tomatoes and peppers. The larvae of these species can be distinguished by their lateral markings. 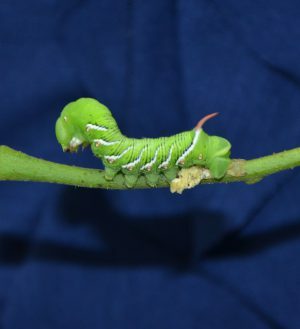 Tomato Hornworms have eight V-shaped white markings with no borders, but tobacco hornworms have seven white diagonal lines with a black border. Additionally, Tobacco Hornworms have red horns, while Tomato Hornworms have dark blue or black horns. These horn are located on the larvae’s posterior and, and along with false eye spots, act as a form of defense against predators. This insect has a short life cycle, lasting from about 30 up to 50 days under ideal conditions. In most areas, Tomato Hornedworms produce two generations per year, but may have three or four generations per year in Florida’s warm lush climate. It can be found in most of the lower 48 states. Female moths normally leave the eggs on the underside of foliage, but sometimes make the deposit on the upper surface. They typically hatch two to four days after they are laid. Tiny, the eggs are spherical, less than 1/16 of an inch in diameter, and translucent green. They easily become an easy snack for a roving ladybug or ants in search of aphids and their honeydew. The larvae can grow to near three inches and are a bright green. The coloration is great camouflage permitting it to blend in with leaves, until it eats them all. It ultimately goes through five larval development stages where it molts between the phases. It pupates underground, emerging as an adult moth. Demonstrating a remarkable ability to hover near its primary food source, nectar producing flowers, this moth takes steps to produce the next generation. It is a slow start for this pest turned pollinator, but its final days are spent in frantic flight between blooms. Hummingbird Moth hovering near its primary food source. To learn more about Tomato Hornedworms and Hummingbird Moths in Wakulla County, visit the UF/IFAS Wakulla County website at http://blogs.ifas.ufl.edu/wakullaco or call 850-926-3931.